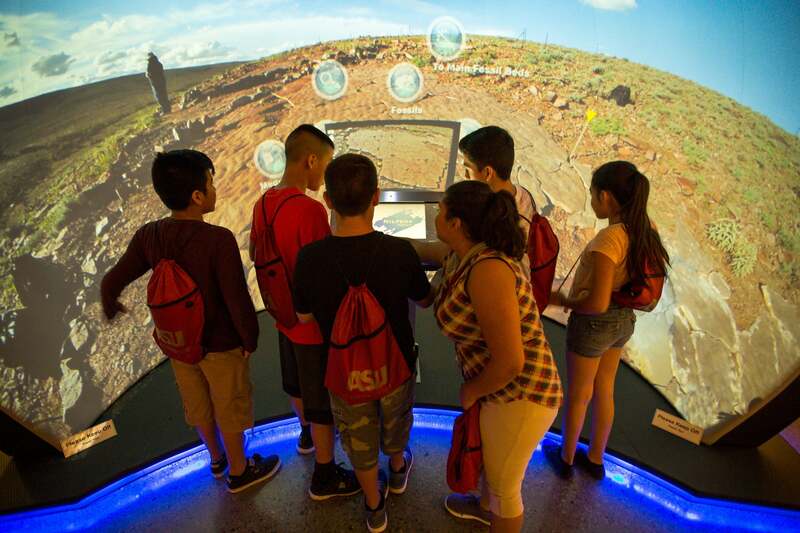 Though the students touring Arizona State University’s state-of-the-art Interdisciplinary Science and Technology Building IV may have different interests, they have one distinctive thing in common: They’re all migrant students. On this rare cloudy Arizona day, they’re anything but as they make their way down Palm Walk to gape at the snakes in Life Sciences A wing and reach out to clutch space dust during the 3-D show in the Marston Exploration Theater. Their trip to ASU is part of the Conexiones Migrant Student Education Program at ASU. As the director of the program, Szkupinski-Quiroga is often met with blank stares when she does outreach. Hidden but not forgotten — for more than two decades, the Arizona Department of Education has been funding Conexiones at ASU through its Migrant Education Program with the goal of improving the academic performance of fourth- through 12th-grade migrant students, who are often moving around the country throughout the school year, making it difficult to stay on track academically. “A lot of times they move to another state that has other common core standards, or they miss things, they miss testing, so then they tend to fall behind,” Szkupinski-Quiroga said. Conexiones aims to close the resulting educational achievement gap, improve migrant students’ skills and options for the future, and develop their self-confidence and self-esteem. When the program found its current home at the School of Transborder Studies in 2014, Szkupinski-Quiroga was tapped to direct and took it upon herself to make some improvements. “I thought that the curriculum that we were giving the kids needed to be expanded and made more rigorous,” she said. At the time, there was a lot of talk about STEM education. Szkupinski-Quiroga recognized the importance of incorporating STEM subjects but also knew that science has a language of its own. With the new curriculum set, Szkupinski-Quiroga set out pitching it to various school districts in Arizona. Those that feel there is a need for such a program in their district take the next step of identifying teachers to have trained as instructors. Then Szkupinski-Quiroga and her staff of previously trained local teachers head out to train them in the curriculum and set up the classroom’s online components. It’s up to the district to decide how exactly they’d like to implement Conexiones — some make it into an after-school program during the school year, some include it as a special class during the school day, and some offer it during spring, fall and summer break. “So we’re working year-round,” Szkupinski-Quiroga said with a smile about her and her team, who follow up regularly after the teacher training to monitor progress and give coaching and feedback. There are currently 28 district-level migrant programs across the state. Since Szkupinski-Quiroga came on board, Conexiones has worked with Chandler Unified, Mesa Unified, Queen Creek Unified, Glendale Elementary, Gadsden Elementary, PPEP TEC Charter School, Somerton Elementary and Coolidge Unified. They are among the largest migrant programs in Arizona. The students visiting ASU’s campus in late June are from the Glendale Elementary district’s summer session of Conexiones, and instructor David Levesque has come along for the ride. A technology teacher at Sunset Vista School during the school year, Levesque enjoys the dynamic nature of Conexiones. He recently taught lessons in which students created a story of the history of Arizona using PowerPoint, planned a virtual vacation using Google Maps, and learned how to calculate volume by building their own Mayan pyramids. Inviting the students to ASU accomplishes that along with other goals. While 10-year-old Joan Gomez marvels at the triceratops in ISTB IV (“When I’m an adult, I’m gonna make dinosaurs real using DNA,” he asserts), students from the School of Earth and Exploration and the Ira A. Fulton Schools of Engineering are learning about the particular educational needs of migrant students as they lead them on a tour of the building. “It’s also about developing new relationships and making connections. And not just with the school districts but also with people in the ASU community who maybe don’t know about migrant students,” said Szkupinski-Quiroga. On the walls in her office are black and white photographs of former Conexiones students, accompanied by a piece of writing. Some are poems, some are short essays. In them, the students describe what it’s like to be the child of a migrant worker — the beauty of the landscape they see when they travel and the feeling when they wake up and their parents are already gone, out to work in the fields. And it’s cases like that, cases in which Conexiones makes “a positive impact in the kids’ lives,” as Szkupinski-Quiroga puts it, that make all the difference.